It comes as no surprise the opulent Mercedes-AMG G63 with its gold accents was unveiled at the Dubai Motor Show. While the curtain is about to fall on the Mercedes G-Class W463, the skilled tuners at Brabus are still finding ways to turn the off-road icon into an even more attention-getter for those willing to reach deep into their pockets. 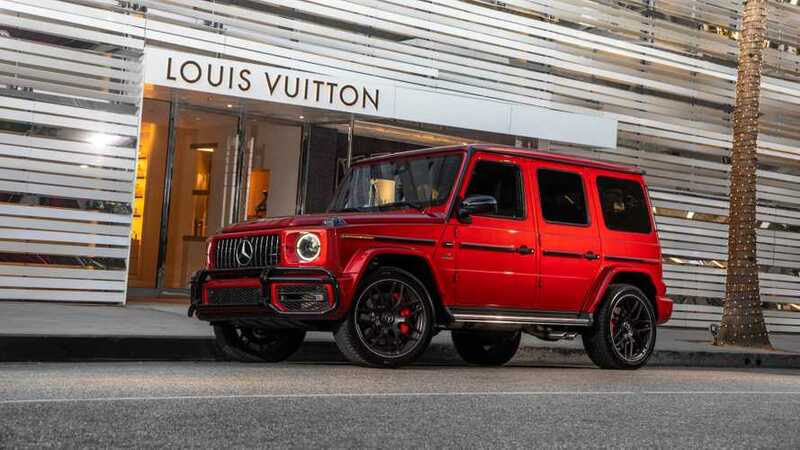 Take for example the new G63-based Buscemi Edition priced at an eye-watering €410,000 before VAT ($485,000 at current exchange rates) as a complete car with all the bells and whistles featured here. Now, before you go thinking the G-Wagen has anything to do with the actor Steve Buscemi, the opulent G came to life with help from 42-year-old Californian designer Jon Buscemi. He was responsible for coming up with the two pairs of exclusive sneakers that feature golden elements just like the car. In addition, each buyer will also receive a three-piece luggage set from the latest collection created by Buscemi and Brabus. As for the G63 itself, it’s an absolute monster that combines numerous gold and carbon fiber accents. 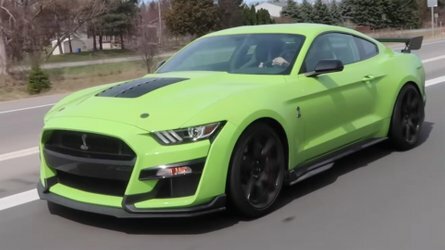 It uses an enlarged V8 6.0-liter (up from 5.5) biturbo engine pushing out a massive 838 horsepower (625 kilowatts) and an astounding 1,069 pound-feet (1,450 Newton-meters) of torque. Despite weighing no less than 5,622 pounds (2,550 kilograms), the Buscemi Edition will run to 62 mph (100 kph) in only four seconds. 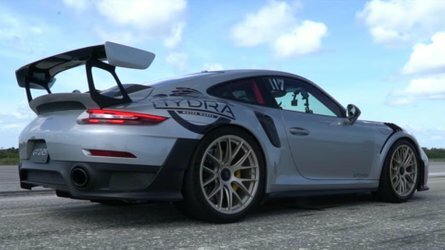 An electronic top speed limiter will kick in at 162 mph (260 kph) to protect the tires wrapping those 23-inch forged wheels. From the blacked-out xenon headlights and wider fenders (adding 12 centimeters / 4.7 inches) to the roof-mounted auxiliary light and the rear spoiler, basically everything has been modified on the outside. Even the spare wheel cover has a golden paint finish to match all of the emblems on the outside as well as the side skirts and brake calipers. Brabus says only the “finest black leather” has been used inside the lavish cabin of Mercedes’ 4x4 legend and even the floor has been covered with the soft material. The golden glazing theme continues and can be noticed on the center console, steering wheel, shift paddles, and in other areas. Optical fibers built into the headliner will give you the impression you’re inside a Rolls-Royce fitted with the fancy Starlight Headliner. The optical fibers can change color as these have been synchronized with the ambient lighting. The Buscemi Edition goes to show sky’s the limit when it comes to customizing a model that has technically been around since 1990. BRABUS 850 BUSCEMI EDITION: Jon Buscemi, one of the most innovative designers of exclusive footwear, and BRABUS, the world’s largest independent automotive refinement specialist, kick off their cooperation with this power off-roader with an output of 625 kW / 850 HP (838 bhp) and a top speed of 260 km/h (162 mph), which is based on the Mercedes G 63. 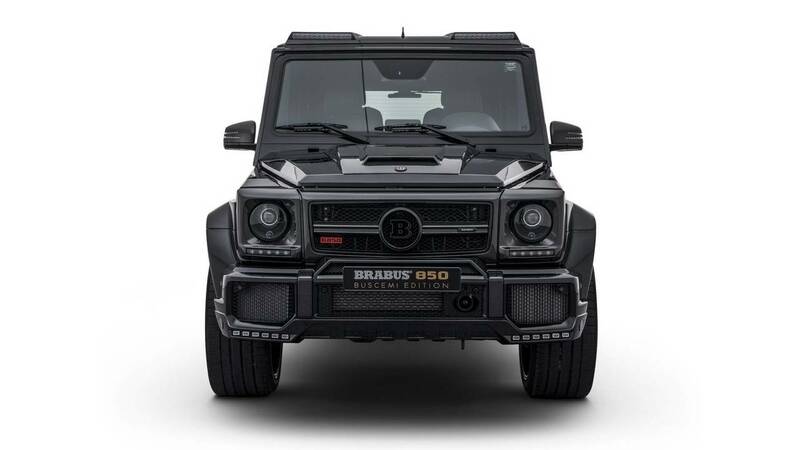 The all-terrain vehicle is powered by a BRABUS 850 6.0 twin-turbo V8 increased-displacement engine rated at 625 kW / 850 HP (838 bhp) and producing a peak torque of 1,450 Nm (1,069 lb-ft). The engine propels the 4x4 despite its weight of 2,550 kilograms (5,622 lbs.) 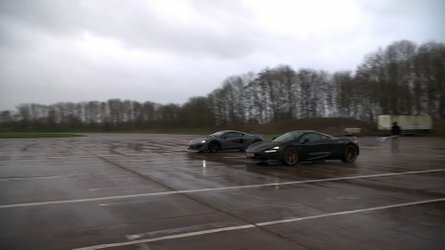 from rest to 100 km/h (62 mph) in just 4.0 seconds. The top speed is limited electronically to 260 km/h (162 mph). Jon Buscemi customized the design of the black supercar: He underscores the luxurious character of the BRABUS 850 BUSCEMI EDITION with golden highlights on body, wheels, and in the interior. In addition, he further accentuates the lavish interior upholstered in the finest black BRABUS leather with red stitching, edging and piping. Other highlights of the special model are the thrilling BRABUS WIDESTAR widebody and the 23-inch BRABUS Monoblock “PLATINUM EDITION” hi-tech forged wheels. The BRABUS Dynamic Ride Control suspension offers a perfect blend of outstanding ride quality and dynamic handling. The BRABUS 850 BUSCEMI EDITION special model celebrates its world premiere at the DUBAI INTERNATIONAL MOTOR SHOW 2017. The exclusive off-roader is an extravagant choice not only due to the golden elements designed by Jon Buscemi. 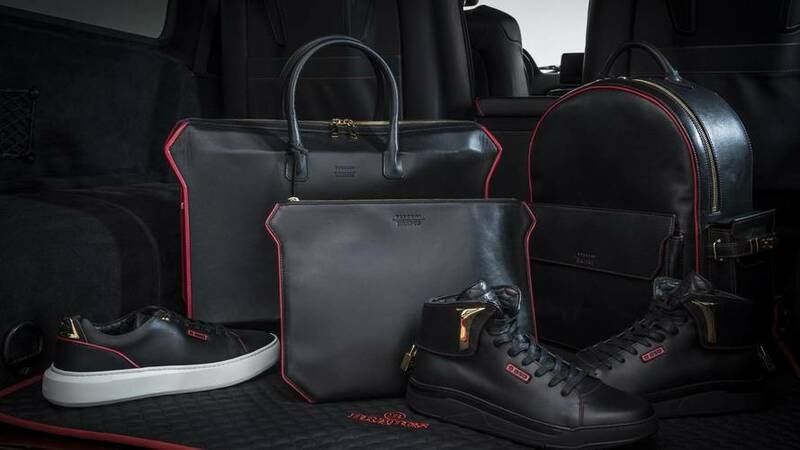 Each vehicle comes with two pairs of BUSCEMI sneakers custom-designed for this special model, and with tailor-made BRABUS BUSCEMI EDITION luggage, whose design of course also follows the color scheme of the vehicle. “I have been a big fan of BRABUS already since the ‘90s,” recalls Californian designer Jon Buscemi. “The chance to design an exclusive special model together with the design team of BRABUS, one that bears my name, is a dream of my youth come true,” says the 42-year-old American. Like BRABUS (Brabus-Allee, D-46240 Bottrop, phone + 49 / (0) 2041 / 777-0, fax + 49 / (0) 2041 / 777 111, Internet www.brabus.com), BUSCEMI is a luxury brand par excellence. The comfortable sneakers are produced from the finest leathers in Italy by hand, and just like at BRABUS, quality is a top priority. Car enthusiast Jon Buscemi accentuates the luxurious character of the BRABUS 850 BUSCEMI EDITION with golden contrasting elements found all over the vehicle. This starts with golden undercuts around the king-sized 11Jx23 BRABUS Monoblock Y “PLATINUM EDITION” hi-tech wheels. 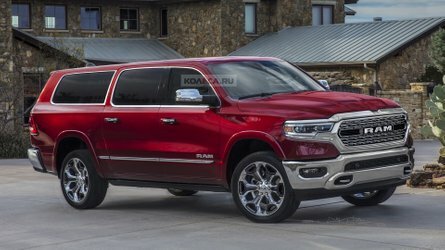 In addition, the running boards received a golden paint finish as did the ring of the BRABUS spare wheel cover on the liftgate, and various emblems on the off-roader. The American also added exclusive interior highlights with golden elements in the cockpit. They include the BRABUS RACE paddle shifters, scuff plates and the panel on the trunk. The designer used red stitching, edging and piping to lend the interior a markedly sporty touch as well. As a result, this special model provides the perfect ambience executed with consummate craftsmanship for an engine as only BRABUS could develop: The Bottrop-based refinement specialist offers the world’s most extensive lineup of engine tuning for Mercedes-Benz automobiles – of course backed by the one-of-a-kind three-year or 100,000-km/62,000-mile BRABUS Tuning Warranty (see BRABUS Warranty Terms and Conditions, updated July 2013). The old adage that the best substitute for displacement is more displacement also applies to this special model – a core philosophy of the BRABUS power unit engineers. The BRABUS 850 BUSCEMI EDITION is powered by the immensely potent BRABUS 850 6.0 twin-turbo eight-cylinder increased-displacement engine. 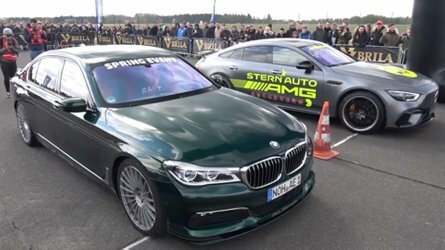 The displacement is increased from stock 5,461 cc to 5,912 cc (333 to 361 cu in) by boring the cylinders in the state-of-the-art BRABUS engine shop and installing eight forged pistons with a diameter of 99 millimeters (3.89 inches). They are connected to a precision-balanced billet-steel special crankshaft with a stroke of 96 (3.78 in) instead of the standard 90.5 millimeters (3.56 in) by billet connecting rods. In addition, both cylinder heads are optimized for mixture flow. The engine peripherals are also upgraded with BRABUS high-performance components. The two production turbos are replaced with turbochargers featuring a larger compressor unit and modified exhaust manifolds. To lower the charge air temperature further, the carbon intake and boost pipes are partially coated with “Gold Heat Reflection” sheathing that instantly catches the eye. In addition, the BRABUS power unit engineers developed a special 850 intake module, which includes an air filter box with larger intake cross-section. To this end, BRABUS integrated a naked-carbon hood scoop, which provides the engine with combustion air by means of slots in the front and back, and a sophisticated air duct system. Metal catalysts and a BRABUS sport exhaust system round off the increased-displacement engine on the exhaust side. Thanks to integrated actively controlled flaps, the driver can choose between a throaty V8 exhaust note in ‘Sport’ mode and a subtle whisper in ‘Coming Home’ mode at the touch of a button on the steering wheel. The fully stainless exhaust system is also a visual treat: With two tailpipes exiting in front of the rear wheels on either side, on this special model chrome-plated, the exhaust also adds thrilling looks. The performance components were perfectly coordinated by the BRABUS power unit engineers and electronics specialists via the electronic engine control system. They not only aimed to achieve outstanding power delivery: Maximum durability and exemplary emissions were also among the top priorities in the performance specifications of the developers. A displacement of six liters and two turbochargers create another BRABUS engine in a class of its own. An output of 625 kW / 850 HP (838 bhp) at a low 5,400 rpm is a new benchmark for SUVs, as is the tremendous peak torque of 1,450 Nm (1,069 lb-ft), on tap between 2,500 and 4,500 rpm. Like all BRABUS components, this high-performance engine, which like the entire powertrain is operated exclusively with high-performance lubricants from technology partner Motul, comes with the one-of-a-kind three-year or 100,000-km/62,000-mile BRABUS Tuning Warranty (see BRABUS Warranty Terms and Conditions, updated July 2013). The combination of ultra-powerful BRABUS 850 6.0 twin-turbo increased-displacement engine, SPEEDSHIFT PLUS 7G-TRONIC transmission with ergonomic BRABUS aluminum paddle shifters on the steering wheel and permanent all-wheel drive delivers a driving performance previously deemed more likely to be possible for a sports car than a hefty SUV. From rest, the BRABUS 850 BUSCEMI EDITION accelerates to 100 km/h (62 mph) in just 4.0 seconds. The BRABUS Vmax Unit included in the engine conversion limits the top speed electronically to 260 km/h (162 mph) to protect the tires. At these speeds, a wider track is also beneficial and consequently the BRABUS supercar is equipped with the thrilling WIDESTAR body. The strikingly styled fender flares add twelve centimeters (4.7 in) to the width of the body and thereby provide plenty of space for mighty 23-inch king-sized forged wheels. The BRABUS 850 BUSCEMI EDITION with serial number 1 sports BRABUS Monoblock Y “PLATINUM EDITION” wheels. The size 11Jx23 hi-tech forged wheels front and back offer an outstanding blend of lightweight construction and maximum strength. The perfect high-performance tires of size 305/35 R 23 are supplied by BRABUS technology partners Continental, Pirelli or YOKOHAMA. Alternatively, BRABUS Monoblock E evo, F and R forged wheels of the identical size are also available. Another design feature by Jon Buscemi is visible at first glance behind the spokes, which despite the strength they offer have a very delicate design and taper off toward the outer edge in the form of a ‘Y.’ They reveal brake calipers that were painted the same golden tone as the other highlights of the limited-edition vehicle. The 23-inch wheels with golden undercuts perfectly fill out the space newly created under the wheel arches by the fender flares. The strikingly styled BRABUS fender attachments, which continue on the front doors, lend the SUV great recognition value from the sides as well. The LEDs integrated into the front and rear WIDESTAR fenders illuminate the running boards when a door handle is pulled or the key fob is pushed. In addition, the braces of the fender attachments also light up. The BRABUS front spoiler attaches to the production bumper and in concert with the LED lights and the new BRABUS auxiliary lights on the roof coins the face of the off-roader. This naked-carbon module is fitted with two powerful LED units. When flashing the headlights or using high beams, two sets of twelve LEDS each provide significantly improved illumination of the road. The BRABUS signets integrated into the front spoiler on either side, which light up together with the entrance lights, represent another component of the new lighting concept. An additional carbon panel under the radiator grille further adds to the enhanced passing clout of the widened G-Class. As a hallmark trait of all BRABUS supercars, the special radiator grille features an integrated BRABUS logo. For an even more thrilling appearance, all chrome parts of the supercar were painted black. To give the front an even more unmistakable look, BRABUS equips the BRABUS 850 BUSCEMI EDITION supercar additionally with black tinted xenon headlights and LED daytime running lights, which are adapted to the vehicle with precise-fit carbon moldings. Thanks to the integrated turn signal function, the original indicators on top of the fenders are eliminated. They are replaced with precise-fit carbon covers. The same material is used for the covers of the two door mirrors. The powerful design idiom of the BRABUS WIDESTAR version with stylized underride guard continues in the rear bumper. In addition to a centrally positioned reflector, an LED rear fog lamp and an LED backup light are integrated into either side of the WIDESTAR bumper. The BRABUS roof spoiler rounds off the rear look effectively. For a perfect combination of high ride quality and safe, sporty handling, the BRABUS 850 BUSCEMI EDITION is equipped with the innovative BRABUS Ride Control suspension, which is available for all G-Class models. The BRABUS hi-tech suspension system was developed in cooperation with technology partner BILSTEIN and features two-way electrically adjustable shocks front and back. The aluminum button with BRABUS logo on the center console is illuminated in blue and enables the driver to choose from two setups: In the comfort position, the off-roader delivers exemplary ride quality. At higher speeds and with a sporty driving style, choosing the firmer sport setup results in more dynamic handling and even further increased safety reserves. In addition, the BRABUS Ride Control suspension features automatic damper adjustment. When the vehicle sensors detect that a spirited driving style may result in certain parameters such as speed, lateral acceleration and steering angle leading to critical handling situations, the system automatically switches to the firmer sport setup within milliseconds. The sportier damper setup then further increases the handling stability of the all-wheel-drive car. In return, the CAN control unit is also able to detect when the driver reverts to a more moderate driving style. It then automatically switches the shock absorbers back to the comfort position. The company upholstery shop created an all-leather BRABUS fine leather interior from the finest black leather for the cockpit of the BRABUS 850 BUSCEMI EDITION supercar. The especially soft and breathable Mastik leather is perforated with pinpoint precision on the seat center sections and features shell-shaped quilting. Fiery red stitching, edging and piping lend the cockpit a markedly sporty touch in concert with the steering wheel’s red center position marking and the Alcantara grip sections, which are very helpful especially employing a sporty driving style. To match the BUSCEMI highlights on the bodywork, numerous elements in the cockpit were also finished with golden glazing. In addition, the special model sports a classy starry sky headliner made from black Alcantara. Its optical fibers change color in sync with the ambience lighting of the entire interior. There are also gimballed LED reading lights in the headliner for the rear passengers. The entire floor was lined with fine black leather in addition. The presence of the ultra-powerful BRABUS engine is also signaled in the interior by the embroidered “850” logos on the front head restraints. Even the trunk was completely restyled and fitted with stylishly integrated storage boxes at the wheel wells on either side. In addition, a high-end sound system with a potent power amp and subwoofer was integrated into the cargo compartment hidden from view. The BRABUS interior designers replace the standard rear bench with individual seats with every imaginable comfort function such as multicontour adjustment, memory and integrated seat ventilation and heating. The new BRABUS center console sits between the rear seats. It is trimmed with the same leather combination as the rest of the interior. The 4.3-inch BRABUS Touch Control Panel is integrated into the top of the console within optimal reach. In standby mode, it shows a clock with BRABUS 850 illustration. In addition to controlling all functions of the rear seats, this innovative control also provides access to the standard COMAND system and can adjust the climate control system. A USB multimedia port, integrated into the top of the console within easy reach, allows charging and connecting a smartphone or tablet with the COMAND system. Two cup holders, which like other decorative elements were fitted with golden glazing by Jon Buscemi, cool or heat the beverages of the rear passengers. Another important feature of the console is the integrated safe. This drawer opens electrically powered to the front only after a code is entered on the BRABUS Touch Control Panel. Other distinctive BUSCEMI EDITION features in the cockpit are the likewise golden glazed BRABUS pedals and door-lock pins. The backlit BRABUS logo of the golden scuff plates at the four doors changes color in sync with the ambience lighting of the interior. The trunk of this special model features a decidedly sporty design as well. This includes the leather mat sporting the same shell-shaped quilting with red edging and a very special “accessories kit” from Jon Buscemi: Every buyer of this special model receives two pairs of exclusive BUSCEMI sneakers, which matching this supercar are decorated with golden elements such as the hallmark miniature padlock of this label. In addition, every buyer gets a three-piece luggage set from the new bag collection jointly developed by BUSCEMI and BRABUS. The BRABUS 850 BUSCEMI EDITION starts at 410,000 euros (plus VAT) as a complete car. 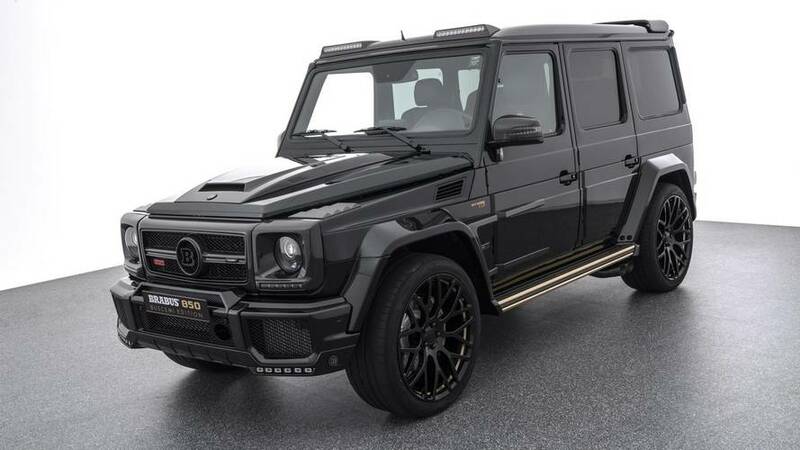 BRABUS 850 BUSCEMI EDITION based on the Mercedes G 63: city 17.2 l/100 km, highway 11.8 l/100 km, combined: 13.8 l/100 km. Combined CO2 emissions: 322 g/km, efficiency class G.